Hopper front with curved design enables convenient part retrieval. Wide stacking ridge enables stacking to save space. 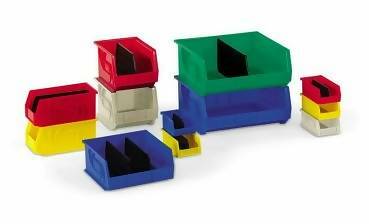 Optional dividers increase versatility. Large front label slot allows bar code or ID card. 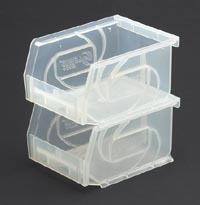 LEWISBins, the cornerstone of the LEWISBins family of products, are available in 7 industry standard sizes. 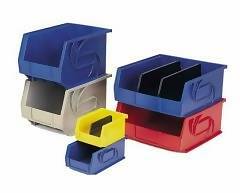 These high-quality polypropylene bins are competitively priced to bring value and efficiency. 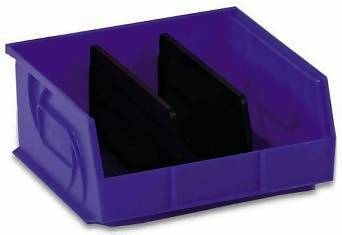 These high-performance bins are used for secure storage of small parts in industrial assembly operations, healthcare, stockroom, warehouse, and hardware merchandising applications. Stock Colors: Red, Blue, Yellow, Stone and Green.